We love buffets in Vegas. There’s an endless variety of food in front of you. You can sample everything from Asian cuisine and pizza to fried chicken and fajitas. But maybe there’s one certain type of food you’re really craving and you’re craving it so much that you want to eat all of it that you can. Studio B always has a nice selection of seafood but on Friday, Saturday and Sunday nights they turn it up a notch with their seafood buffet. You’ll find shrimp cocktail, Peri Peri shrimp, fried shrimp, tempura shrimp…are we starting to sound like Bubba from “Forrest Gump” here? You can also indulge in Alaskan snow crab legs both chilled or steamed, ginger crab, lobster mac and cheese, steamed clams and mussels, crawfish boil, ceviche shooters, oysters, fried calamari, salmon, baked lemon Dory and lobster bisque. Oh, and sparkling wine is included in the buffet cost too. The seafood buffet is $39.99 for adults and $26.99 for kids 5 – 8 years old. This newly-redesigned buffet features six food stations serving a variety of types of cuisine. If you’re a seafood lover, you should visit on a Friday or Saturday night for the buffet’s crab leg fest from 4 p.m. – 10 p.m. The cost is $26.99 for adults and $17.99 for kids for all the crab you can eat. 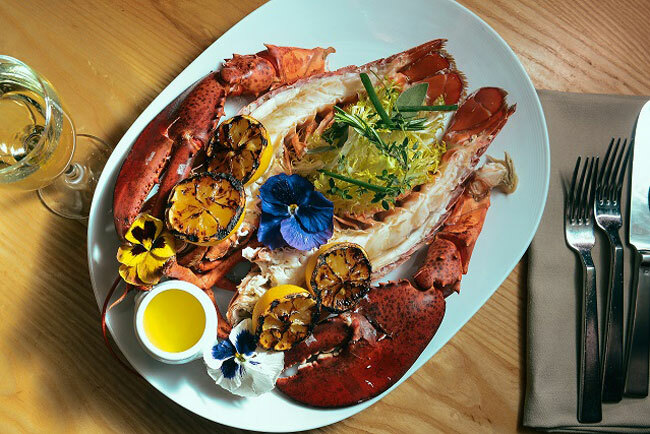 The Bacchanal is already an amazing buffet filled with 500-plus dishes, but just in case you want a little something more special you can now order a whole fish or a whole lobster. Whole fish options include Norwegian Mackerel for $21.19 per pound, New Zealand Tai Snapper for $26.12 per pound or Golden Pompano for $22.19 per pound. Grilled fish are stuffed with fresh lemons and aromatic herbs, seasoned with fleur de sel and fresh cracked black peppercorn. You can also choose to have your fish fried with tamari soy and yuzu sauce and topped with ginger and scallion. Want something really decadent? A whole poached lobster can be purchased for an additional $150. The meal includes immediate seating and the choice of a glass of Veuve Clicquot Ponsardin Rosé or Veuve Clicquot Ponsardin Brut. If you’re more of a turf person than a surf person, you’ll want to head to the South Point’s Garden Buffet on Monday nights for their barbecue buffet. In addition to the regular buffet items they serve meat options galore including slowly roasted bourbon glazed pork loin, barbecued spare ribs, fried chicken, a burger bar, Memphis-style pulled pork and more. To go along with the barbecue favorites you’ll find traditional side dishes like baked beans, corn on the cob, bacon and cheddar potato casserole and chili. If that’s not enough for you, there’s also two carving stations with hickory smoked beef brisket and smoked salmon. The barbecue buffet runs Mondays from 4 p.m. – 10 p.m. and is $14.95 with a player’s card or $18.95 without a card. Every Friday – Sunday from 3 p.m. – 10 p.m., guests at the Bellagio buffet can choose the gourmet dinner option for $39.99. In addition to all of the standard fare you can enjoy Ikura and Tobiko caviar either alone or as a complement to other dishes. The caviar bar attendant will top things like house-made blinis, buckwheat waffles, freshly-rolled sushi and ahi tuna cones with your caviar of choice. If you want to make your Bacchanal Buffet experience really extravagant you can buy Sasanian Imperial Caviar for an additional $150. There’s also the Caviar Dreams package, which includes the caviar and accoutrements, one bottle of Dom Perignon and immediate seating. The package is priced at $500 for two people or $650 for four people. For more than 30 years, the Sterling Brunch has been one of the most indulgent buffets in town. 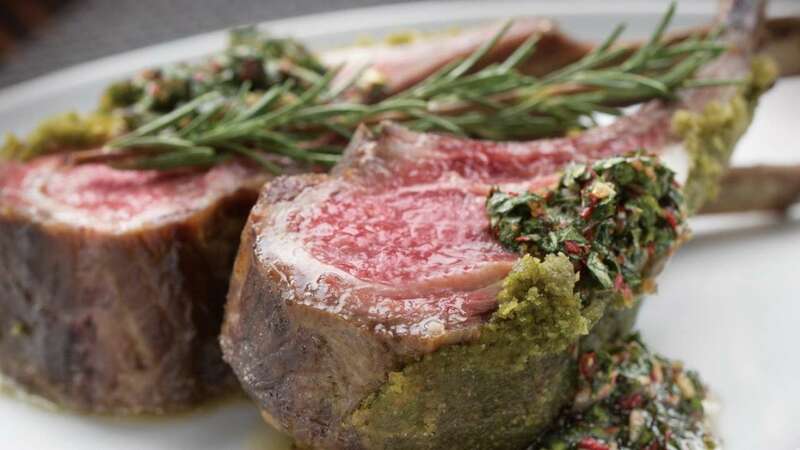 On Sundays, the BLT Steak restaurant at Bally’s houses the brunch, which features unlimited Perrier-Jouët Champagne and unlimited American sturgeon caviar. The buffet also serves gourmet items like Alaskan king crab legs, lamb, lobster tails, prime rib, sushi, oysters, truffle mashed potatoes, banana bread pudding French toast, a custom omelet station, a charcuterie plate and just about everything else you can imagine. Items like eggs Benedict and Belgian waffles can also be ordered from a menu. The Sterling Brunch is $90 per person. On Wednesdays The Garden Buffet brings an island vibe to South Point with a luau-themed buffet menu. There are six live cooking stations with choices like egg drop soup, spring rolls, tossed Hawaiian salad, Oriental noodle salad and lomi salmon. Menu highlights include sushi and nigiri rolls, miso glazed tuna with Asian vegetables, soy and ginger crusted mahi mahi, Polynesian coconut curried chicken, kalua pig and Waikiki Beach barbecued pork ribs. The dessert station features coconut cupcakes and pineapple upside-down cake. The big bonus? The price includes unlimited Mai Tais. This specialty buffet is available every Wednesday from 4 to 9 p.m. for $14.95 with a player’s club card or $19.95 without a player’s club card. Every Saturday night from 4 p.m. – 9 p.m., the Seasons Buffet takes guests to the islands with its Polynesian buffet. Special items include aki poke, sushi, kalua pork, pork lau lau, teriyaki meatballs, chili-mint wings, lomi lomi, chicken curry and suckling pig with crispy skin. The buffet costs $21.99 . Specialty nights are subject to change. 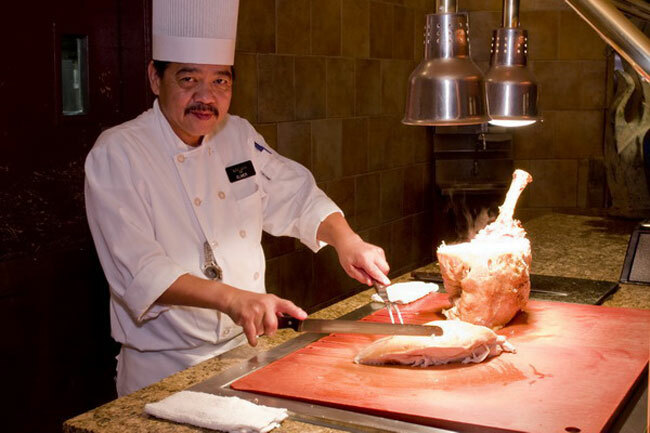 Read our complete list of all Vegas buffets.